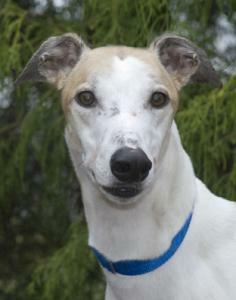 Quantico is a big friendly white boy with tan patches. He is an extra large guy that raced at 82lbs. He turns 4 on August 8th. His sire is the famous Kiowa Mon Manny and his dam is RLM's Winter. Quantico was a good racer that started out at Tri-State in WV then moved to Birmingham AL. He raced at the top A level in Birmingham and raced 132 races so had a pretty long, successful career. Quantico was interested in the cat when he met it but quickly lost interest after the cat slapped him a few times so he may be trainable with cats. He did fine with the small dog he met though. He traveled well on our trip back from the track. Quantico is a very friendly bouncy boy that loves people. More as we get to know him.